On the face of it let me admit that it sounds really cool, looks impressive and sounds like what Super Heroes like Batman and Superman grew up in (seen in the movie Shoot ’em Up). But if you ask me, unless I was shifting base to Iraq, I wouldn’t subject my baby to this stroller. Imagine putting a live baby in this bullet proof contraption and that too for a demo! The video kind of loses its credibility too. Not only does it gives you the creeps fathoming an experiment gone awry, but also wonder what kind of weirdos would do this to a baby! Incase you are still interested you can check out the details after the jump. BTW it comes with a rainproof cover as well; so considerate! – Shopping basket. Keep your baby and your groceries safe. – Adjustable leg rest. The stroller grows with your baby. – Waterproof lined, detachable hood. – Multi lie-back position (does not lie flat). – Lightweight, umbrella fold stroller. 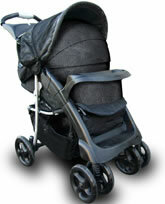 – The seat is fitted with a 5-point harness to ensure the safety and security of your child. – Linked brakes for safety. – Comes complete with instructions. You do realize, of course, that the site is a hoax to advertise the Clive Owen movie, right?